The decision to highlight weapons of mass destruction as the main justification for going to war in Iraq was taken for "bureaucratic reasons", according to the US deputy defence secretary. But in an interview with the American magazine Vanity Fair, Paul Wolfowitz said there were many other important factors as well. 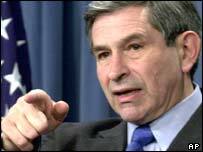 The famously hawkish Mr Wolfowitz has been a long-time proponent of military action against Iraq. Picking weapons of mass destruction was "the one reason everyone could agree on", he says in the interview. The other factor he describes as "huge" was that an attack would allow the US to pull its troops from Saudi Arabia, thereby resolving a major grievance held by al-Qaeda. "Just lifting that burden from the Saudis is itself going to open the door to a more peaceful Middle East," Mr Wolfowitz is quoted as saying. Last month, the US announced it was pulling most of its troops out of the country. The BBC's Ian Pannell in Washington says that although Mr Wolfowitz's remarks will be seized upon by critics who claim there was little justification for the war in Iraq, it is unlikely to have any political consequences in the US. All opinion polls show most Americans are unconcerned about the failure so far to find weapons of mass destruction in Iraq. Speaking earlier this week, Defence Secretary Donald Rumsfeld claimed Iraq may have destroyed them before the US-led invasion.